Buy Microwave Microwave Dehydration Machine/High Quality Microwave Tea Leaf Dryer - Shandong Microwave Machinery Co.,Ltd. Shandong Microwave Machinery Co.,Ltd.is a Tea Microwave Dryer Sterilizer factory specializing in the production of Microwave Microwave Dehydration Machine/High Quality Microwave Tea Leaf Dryer, scientific research,manufacturing,installation, commissioning.Shandong Microwave Machinery Co.,Ltd.can provide Tea Microwave Dryer Sterilizercustomers with design and services of 1-2000 tons Microwave Microwave Dehydration Machine/High Quality Microwave Tea Leaf Dryer. Shandong Microwave Machinery Co.,Ltd. have finished hundreds of successful projects Tea Microwave Dryer Sterilizerover the years: peanut oil, soybean oil, rapeseed oil, cottonseed oil, sunflower oil, sesame oil, animal oil,grape seed oil, acer truncatum oil, peony seed oil, walnut oil, hemp seed oil, pine oil, tea seed oil, papaya oil, milk thistle seed, and other special type Tea Microwave Dryer Sterilizeroil. Shandong Microwave Machinery Co.,Ltd. have independent import and export department. Shandong Microwave Machinery Co.,Ltd. Tea Microwave Dryer Sterilizerequipment has been successfully exported to more than ten countries: Russia, Australia, India, Afghanistan, Cameroon,and so on. 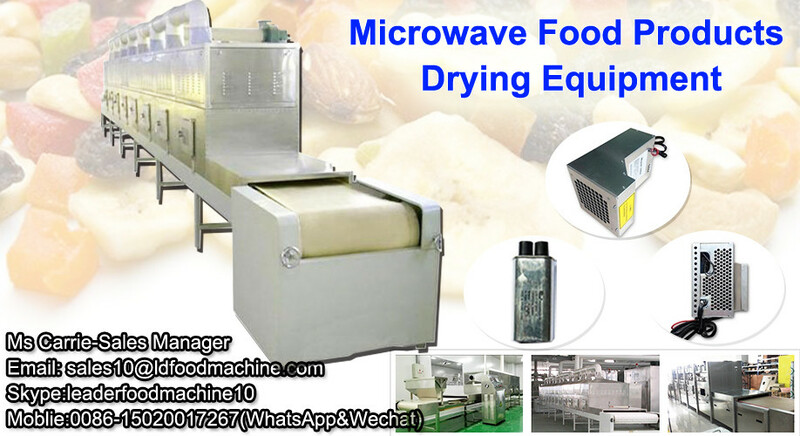 Microwave Microwave Dehydration Machine/High Quality Microwave Tea Leaf Dryer are widely used for drying and sterilizing powder, granular, flakes or colloidal form foods, nutritional health products, grain, agricultural and sideline products(rice, cornmeal), food, vegetables, and fruits, seafood, pickles,spices ( chilli powder, ginger powder, garlic powder, aniseed, cinnamon, angelica, cassia bark, fennel etc) , jam, a variety of small packaging and pet food mildew sterilization preservation. E.Microwave Microwave Dehydration Machine/High Quality Microwave Tea Leaf DryerMicrowave preventing leakage parts etc.